Today’s Final Jeopardy answer (in the category 20th Century Plays) and game statistics for the Tuesday, September 25, 2018 game between Courtney Llewellyn, Vincent Valenzuela, and 1-day champion Nancy Schoppa. 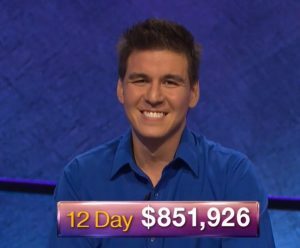 Rob Salerno returns as champion on Jeopardy! ; see who joins him here! Jeopardy! needed to break out the bleep on the July 13, 2018 episode. Lauren Kiehna returns as champion this week on Jeopardy!. See who joins her here!